Le Macchie Alte is an organic farm of 420 hectares. We grow grains and fruits of ancient varieties, olives, cereals and fodder and breed the typical white Maremma cows, wild boars and the famous “Cinta Senese” pigs. Nestled deep in the peaceful rolling hills of the Tuscan Maremma area, our organic farm is composed by three ancient stone farmhouses. Dinner is served on the veranda, on large wooden tables. Our cooks have been cooking typical Maremma dishes for a lifetime, and use only organic ingredients, most of them produced by ourselves. In the large garden that surrounds the guesthouses, you can enjoy the quietness of the pool or lose yourself watching the beautiful panorama. If you love trekking or just like to walk a bit, you can chose from a 6 and a 9 km trail, both starting on our premises, that will make you discover and fall in love with what the authentic Tuscan nature has to offer. You can also visit the beautiful medieval villages nearby, visit some of the many wine producers or regenerate in the unique “Terme di Saturnia” where people have enjoyed the benefits of the thermal water from Ancient Roman times up til now. In short, if you come to Le Macchie Alte you will certainly find ways to unwind and not be bored! 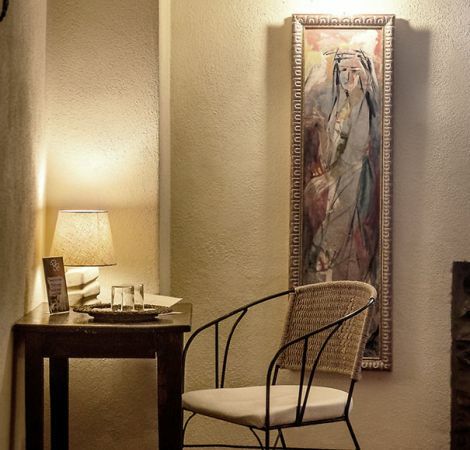 All our typical tuscan farmhouse style rooms have ceiling fans and a private bathroom equipped with towels, hygiene products and a hairdryer . We offer a daily changing menu that offers you a real taste of Maremma cuisine. Strictly organic and 0 km. Salt water pool with sunbathing area equipped with sun loungers and deck chairs, available to guests. Swimming pool with sunbathing area equipped with sun loungers and deck chairs, available to guests. “Le Macchie Alte”: a combination of nature, beauty, simplicity, taste, combined with excellent organic food, respect to nature and animals, hospitality. The room was clean & comfortable and the pool…a perfect place to spend the afternoon and take in the views of Manciano on the distant hilltop! The location is situated on the ever-rolling landscape with the lodgings on a ridge overlooking the amazing countryside and the farm property. 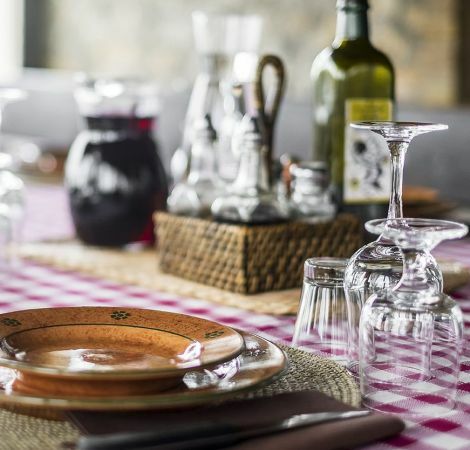 The dining is appropriately farm-style, on 2 long tables where all the guests merge to enjoy the delicious local recipes prepared with love and care. Another common room offers a fireplace and space to enjoy some free time. Overall a dream place! In the heart of Maremma countryside, two ancient stone farmhouses in the middle of an organic farm! Amazing typical dishes, all the raw materials were from the farm! The rooms were spacious and clean.There are also tho paths for walking and discover the stunning fields, and the wood…..We love Le Macchie Alte! Le Macchie Alte…. A real farm in an amazing land! We had a wonderful time here!!! Situated on a smaller hilltop with views to of Manciano and of Montemerano, they grow grains of ancient varieties, olives, cereals and fodder and breed Maremma cows, wild boars and pigs. 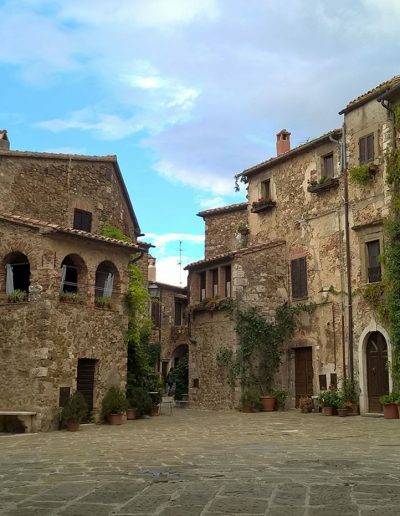 Do not miss the village of Montemerano or the Thermal Cascades of Saturnia! We spent 4 nights here and we really had a wonderful time…Here you can find the best ingredients the region has to offer, great food, nature, beauty and the people who own it are incredibly helpful and interesting! I really suggest a visit! 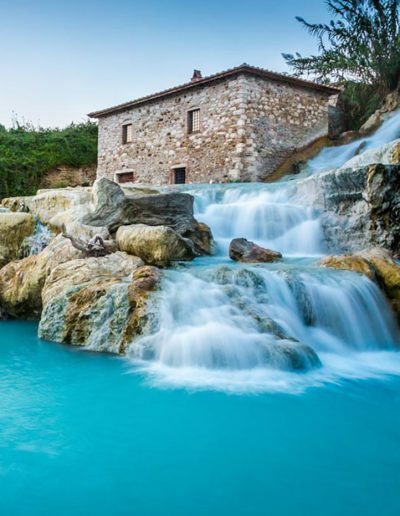 The stunning Cascate del Mulino, the most beautiful free spas in Tuscany ... just a few minutes from our farm this free, little paradise at no cost! Thermal waters at 37.5 ° C, rich in beneficial and healing properties. A true spectacle of nature, the imposing waterfall of sulphurous water, the pools naturally carved in travertine and the pristine nature ... unmissable! Montemerano is “One of the most beautiful villages in Italy” and the reason is simple ... it's graceful! A medieval village that has managed to keep its past intact, even today walking through the alleys of the historic center will seem to live a dip in history, rediscovering ancient traditions, monuments and period buildings. Do not miss the Piazza del Castello, the city walls and the Church of San Giorgio. 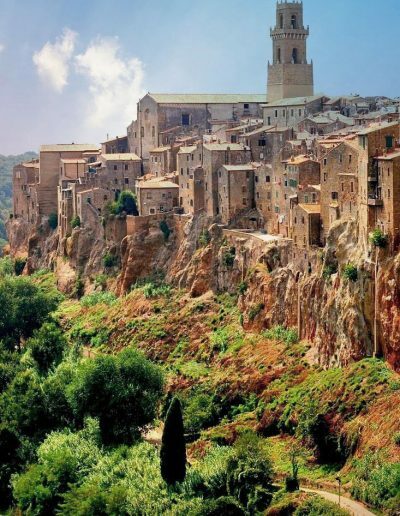 The “Little Jerusalem” of the Tuscan Maremma is "One of the most beautiful villages in Italy" and one of the unmissable destinations to discover in the Tuscan Maremma. Situated over a tufa hills, its origins date back to the Etruscan-Roman period, as evidenced by the necropolis and the imposing "Vie Cave". Pitigliano is a fascinating village, particularly interesting the Palazzo Orsini, the Duomo, the Medici Aqueduct, the Jewish Ghetto.